​Learn, in only 10 minutes, about the 5 mistakes we make when we are introduced in Spanish and how to avoid them! Would you like to feel confident ​when you talk to your Spanish friends? ​Talk to the store assistant or ​make that local phone call and feel comfortable doing it? And all in all, start feeling comfortable with your Spanish skills? Then you came to the right place, because I can help you get to where you want to be. and I can help you improve your Spanish. you don’t need to go to class for years, or study big text books. ​All you need is to understand and practice the key structural features of the Spanish language, especially those that are the most different from your own language. That is possible, and that's where I focus! ​Receive my newsletter ​and start improving your Spanish! 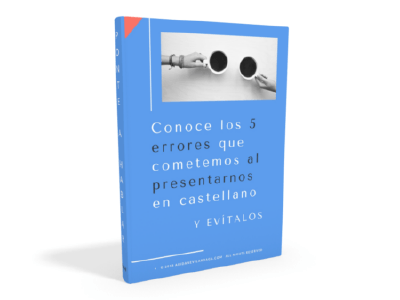 Get access to the guide and a free video class ​where ​​I will show you, in ​just 10 minutes, ​5 common mistakes ​​we make when we introduce ourselves in Spanish and how to avoid them! ​I want to start improving my Spanish!